The following are common questions asked by board members. Click on a link to see the answer. What can I do if I see an issue on the board that needs to be addressed? What is the MB, CB, and OT Board? Why do some people have a green dot next to their name? How do I get a dot? Do the Corrs post here? What smiles are available to use in posts? How do people get bold, italic, and underline in posts? How do I insert a link in my post? How do I insert an image in my post? How do I embed a YouTube video in my post? What is the Invision Site? and How do I access it? What is a PM? and How do I access Mine? How can I send a board member an email? How is the Fan of the Month chosen? Can I recommend someone for Fan of the Month? How do I submit an artist for Artist of the Moment? Does my artist of the moment submission have to be a musician? How is the Picture of the Week chosen? Can I suggest a Picture of the Week? Do the Corrs support any charities? Why are there flying cloggs on the OT Board? What is the difference between PAL & NTSC? What are DVD regions? and How does 'Region Free' work? How can I share a video file with members of the board? I've downloaded a video but it won't play. Why? What are good media players to use? Where can I buy Corrs CDs and DVDs? The password you would like to have. Cara will get back to you very quickly and you'll be all set to post. however please remember I am just one person and I have work and family as well. to check that your request didn't get lost in the inbox somewhere! We try to keep on top of what's happening with the board, but if you see something we've missed, drop us a line. Keep in mind, moderating is far from an exact science. We try to keep the board a nice place to visit for everyone, but unfortunately can't make everyone happy, all of the time. But we hope you'll bear with us! Questions: If you have a question about how to do something on the board - check here! Hopefully the answer is already here. If not, make a post on the board and someone will tell you what you want to know. If no one else gets to it before us, we'll definitely respond and explain things for you! Registering: If you would like to register, please contact Cara. Technical Issues: If you get an error message while visiting the board, please make a post directed to Marc (MAH) to let him know about the problem. Other problems with the technical workings of the board itself can be directed to Marc (MAH) or Cara. Other Questions or Issues: Please check out the board guidelines for help in determining what the general guidelines for the board are. That will probably answer most questions about what's acceptable and not when posting. You can contact us with other questions or concerns and we'll get back to you as soon as possible. We're glad you've stopped by and hope you enjoy it here! MB is short for "Main Board". This is the board you see when first coming to the site. CB is short for "Corr Board" and is the same as the MB. Here is the place to discuss all things Corrs related. Just remember, follow the guidelines. OT is short for "Off Topic". This Board is a place for Corrs fans to discuss subjects other than the Corrs. Topics are many and varied in OT land. The green dot ( ) next to a user name shows that the poster is a registered member of the board. To register, email Cara and she'll get you set up with a user name and password. You acquire the coveted green dot. You reserve your user name which means that no one can post pretending to be you. It helps avoid confusion by allowing each poster a separate identity, meaning there are not 10 people posting with the same name. It allows you to post anytime, anywhere. We used to allow non-registered users, however some spam problems forced us to lock it down to only registered users a few years ago. This section was more relevant before that change! Now, all IP addresses are blocked, the only way you can post is if you are a registered user. As a registered member you can communicate with other members via email and PM's through the Invision Site as well as publish your email and IM contact details for other members to see. The Corrs are registered as members of our board. Jim visited fairly often at the Corrboard (our predecessor) however has not yet posted on the new board. You will be able to tell a "real" Corr post from an impersonator because the Corrs will have a red dot ( ) by their name, in place of the usual green dot. Unfortunately because of recent spam activity we have been forced to (at least temporarily) block all IP addresses. If you would like to join our board we'd love to have you. Registered members are able to bypass this block because the block only stops annonymous posting. So, please contact Cara to get registered and we look forward to your participation on the board! Note: This only works in the message body, not in the subject line. The ability to specialize text in the subject line has been disabled. Inserting a link in your post is really very easy. Clear the example link that is there and insert the link you want to have in your post, for example "http://www.thecorrsclub.com". Then hit okay. Your link will automatically be inserted into the message. It's just that simple! When you send your post, your link will appear in the message. You may be wondering how some people make a link using a word or phrase for the link instead of the entire website address. Your link will then appear as the phrase "The Corrs Club" in your post. There are two different ways of inserting an image in your post. You cannot post a picture that is stored on your computer. In order to post a picture, you must first upload it somewhere to be stored online. There are several free photo storage sites online, for example Photobucket and ImageShack. The first way to insert an image is almost exactly like inserting a link into your post. Clear the example link that is there and insert the link for the image you want to have in your post. Then hit okay. Since you are asking for an image to be displayed in the message, make sure the link you use is actually a link to an image. Lots of people try to link a webpage and are confused when their image does not appear. (Hint... if the URL ends with .php or .html, it's not an image. Occasionaly a URL ending with .jpg, .jpeg, .png or .gif will still not work. This could be because you are linking to a site that requires users to be logged in to view images (e.g. MySpace). Another reason is that some sites do not allow 'hotlinking' (or linking to an image from an external site). If this is the case you can insert a link instead. When using an image hosting site like Photobucket and ImageShack you will most likely be given a URL Link, an HTML TAG, and an IMG Code. Be sure you use the URL link when using this process for inserting an image. Your image will automatically be inserted into the message. It's just that simple! When you send your post, your image will appear in the message. Alternatively, if you are using Photobucket or ImageShack you can copy the IMG Code directly and paste into the body of your post and your image will be inserted automatically when you send your post. Embedding a YouTube video in your post is really pretty simple. Start by finding the video you'd like to share on YouTube. At the bottom of the video click on "Share:"
The video will automatically be inserted into the message when you click "Send Message" and post. Please just be sure you take a moment to think about whether the video you're thinking about sharing meets our Guidelines with regards to Copyright before you post. Especially in the case of Corrs videos - since we're here to be fans and supportors of the band. What Is The Invision Site? When the old Corrboard closed its doors, the current board we all know and love wasn't quite up and running yet. In the interim period we used a commercial board from Invision Power Boards to keep in touch and have a way to keep posting. Message posting has been completely moved to the unique Corrboard-style threads, however the 'Invision Site' is still running in the background. 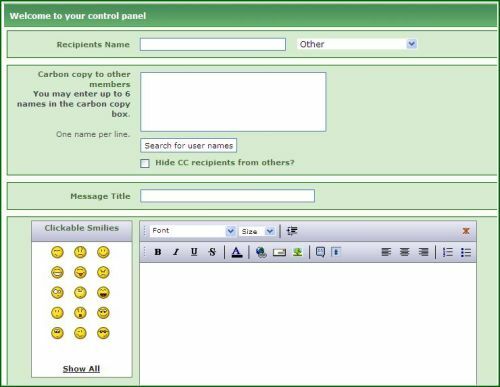 It can be used for sending emails or personal messages as well as viewing information about our members. How Do I Access The Invision Site? To access the Invision Site from the message board click on the name of any registered user. This will bring up their profile and give you access to the site. 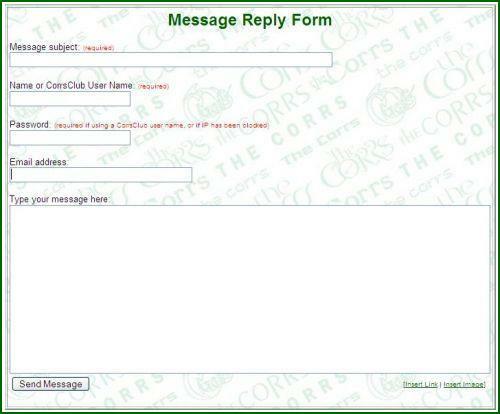 Alternatively, you can access the site by this address: http://thecorrsclub.com/inv.php . You MUST log in to the site using the log-in option on the top of the page. If you get to the site by clicking on a member's name and click on Send a Personal Message or Send an Email this will take you to a page to log-in. However, you cannot actually log in from this page. When you do, it will send you back to the main Corrs Club page. If this happens to you, simply click on a member's name to return to the Invision site and use the sign-in at the top of the page. A fix for this bug is in the works, but until then, just be sure to use the sign-in at the top and everything will work perfectly for you! PM is short for 'Personal Message'. This is a feature on the Invision Site that allows you to send a message to another board member. In the upper right-hand corner click on "Members" to search for the member you wish to send a PM to. From the drop-down menu select the first letter of the member's name and then click on "Name begins with..."
You will now have a list of all members beginning with that letter. Page through the list until you find the member you are looking for. When you have found the correct member, click on their name to bring up their profile. In their profile there is a box labelled "Communicate". In that box, click on "Send A Personal Message". This will bring up the Personal Message Form. It will have the Recipients Name filled in automatically for you. Type your Message Title and Message and hit send! And you're done! Your PM will be sent to the member. After logging in, in the upper right-hand corner click on "# New Messages". This will take you to your message center and you can read new messages, or send messages! There are two different ways you can send an email to a board member. If a member has chosen to keep their email address confidental you can send them a message though the Invision Site or if they have filled in their address on the Message Reply Form when posting you can find their email address using these steps. Find a post by the person you want to send an email. Hit "Post Reply" to their message. Scroll down to the bottom of the reply page - to where you can see the "Original Message". Hover your mouse over the person's name. In the bottom left of your browser you will see "mailto:" and the member's email address. In the upper right-hand corner click on "Members" to search for the member you wish to send an email to. In their profile there is a box labelled "Communicate". In that box, click on "Send An Email". This will bring up the Email Form. Type your subject and message and hit send! And you're done! Your email will be sent to the member. The Fan of the Month is chosen by the board administrators. It is any board member whose contributions make the board a better place to be. Whether this comes simply from being a cheerful, enjoyable presence on the board, or whether the person is one of the most knowledgeable fans in the community and always sharing their knowledge - any board member that has posted in the previous month and made a strong contribution to the board is eligible for Fan of the Month. We love to receive recommendations for Fan of the Month!! If there is a board member that you feel deserves the honor - please email Cara at thecorrsclub@googlemail.com. Please be sure to include the board member's name and the reason(s) you want to submit that person as the Fan of the Month. If you would like your recommendation to remain anonymous please let us know - otherwise we will likely state that you referred the Fan of the Month for the honor. In addition - if you are able to include the links to the artist's Facebook, Twitter, MySpace, and YouTube accounts that helps make things a bit easier on Cara when she puts the artist up as the featured artist. If you would like to include a short write-up about the artist you can. Cara will make a post of the OT Board when she posts your recommendation and copy the write-up you send. However - if you'd prefer to wait and make your own post when you see your artist appear that is just fine!! Cara posts the artists in essentially the order she receives them. If you send multiple recommendations at once she might intersperce them other people's recommendations - but never fear, she will post them all! She loves having plenty of artists waiting in the queue to post, so feel free to keep sending recommendations, even if you haven't seen your previous submission posted yet! Does My Artists Of The Moment Submission Have To Be A Musician? Your Artist of the Moment recommendation can be for any type of artist. Most of the recommendations we've received have been music related but you can submit any type of artist - musician, painter, dancer, etc. Music submissions can come from any genre - we've even had soundtracks and/or composers featured. The board administrators choose the Picture of the Week on a weekly basis. We try to alternate between pictures of each individual member as well as with pictures of the band as a whole or sets of siblings. Other than that 'guideline' the chosen picture for each week is really just the picture that grabs our attention (for whatever reason!) that week. Yes!! Please do! Almost all of our Picture of the Week selections come from suggestions made by board members. If there are any pictures you love and would like to see featured as the Picture of the Week, please email them to Cara at thecorrsclub@googlemail.com. We usually have a running group that we're choosing from so you might not see all of your recommendations posted right away - but unless something you recommend has already been featured as the Picture of the Week - we will use it eventually! We're sure the Corrs support many charities. One that they have very publicly supported in the past is: Orbis Ireland. Yes, this may seem like an odd edition to a FAQ page, however, this really is a frequently asked question on this board! Winegums are an unexplainable phenomenom of the OT board. It started one day when Jason Parry said he liked winegums and ryan said he did too. The rest, as they say, is history. There are odes to winegums, poems exhalting their magical qualities, posts despairingly asking where poor benighted souls in the winegumless parts of the world (primarily the US) can aquire said delicious morsels. What can be divulged here is that they have nothing to do with wine, but their contents may well put you off if you read about the gelatin before you eat one. 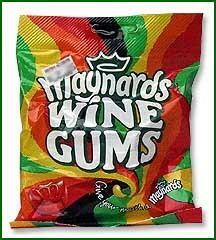 In all seriousness... Winegums are a gelatin based candy, kind of like gummi bears. They are popular in the UK and Canada and have become a mostly unexplainable favorite topic of discussion among fans. Come make a post about winegums on the OT Board and you'll see what we mean! The obsession with cloggs started one day when LindaJ, Ramon, and Felicia decided to tease Maureen (since she lives in "Clog Land"). Not surprisingly, the silly stereotype that everyone in the Netherlands wears cloggs is a bit annoying to those who know better. In frustration, Dutch members of the board began throwing cloggs at the offending members. The rest... is history! Cloggs have since become common weapons on the OT Board and are often hurled between members in a friendly fight. There have been many pictures dedicated to cloggs, including the infamous cloggmobile and numerous pictures of the Corrs in cloggs. If you'd like to see the pictures, come make a post on the OT Board and I'm sure someone will dig them up for you! PAL and NTSC are the television standards for different parts of the world. There is also a third - SECAM. NTSC covers the United States, Canada, Japan, and a few other places. SECAM covers France and Russia. PAL covers the rest of the world. PAL, SECAM, & NTSC are basically a different way of displaying the picture on the television. The main differences are in the number of horizontal lines displayed on the screen, and the number of frames per second displayed. Because of these differences, something formatted for PAL will not play on a television made for NTSC (and vice versa). Some televisions are now made to handle both PAL and NTSC. Also, some DVD players are able to adapt the signal to something your television can understand. However, before buying something in a standard not commonly used in your area, you probably want to verify your electronics can handle the conversion. DVDs made for PAL are also compatible with SECAM. DVDs are encoded with a region code that denotes the area(s) of the world where distribution and playback were intended. Most DVD players are formatted to play only DVDs with the region code matching the area the player is sold. Click here for a map of DVD regions. Also, 'Region-free' DVD players are available. These players will play any DVD, regardless of what region it is coded for. If you want to learn more about region encoding and DVD players, etc. this site has a lot of information. Visit their FAQ page for a list of common questions. There are several online video sharing sites. Everybody has their preference, and each site has different limits. Below are links for the most popular ones. Check them out and see which fits your needs! Rapid Share is also available, however NOTE that Rapid Share has problems with some ISPs so is probably best avoided! YouTube is always a good choice and if you use that you can even embed the video directly in a post on the board if you want to! If none of those sites meet your needs, contact one of the moderators and we may be able to help you out. You can buy Corrs items from most major retailers. ebay is of course one of the best sources for second-hand items. eil is another well-known resource for older and more rare memorabilia. They have almost everything available, however the prices do tend to be a bit steep! Please note, this is just a selection of sources, and by no means includes very possible place of purchase!